Copyright Notice: This walkthrough was written by H. S. Teoh and published with his permission on RavenGames in the early 2000s when it was managed by RambOrc. Go back into the chapel, step into the teleport and enter the portal to the next level. The key is in a secret area somewhere in the chapel. Hint: vandalize the chapel! (ie. smash the stained glass). Once you find the secret passage, pull the switch inside to open those big yellow slabs. Enter the now revealed door, and look for a switch. This will lower the pillar in the centre of the room to reveal the Emerald Key. Once you get the key, the big yellow slabs begin to move. Careful! It’s a trap. You will get crushed by the slabs unless you run through when all of them are open. You need to time yourself carefully for this. Note: one of the yellow doors in the room will open if you’re playing deathmatch. The teleport inside takes you up to the top of the cliff outside the chapel, where there’s an item or two. This only applies to deathmatch games, though. So far, I’ve not been able to open this area in single-player mode. Open the big door at the foot of the fort with the Emerald Key. Pull a switch inside to open a door that leads to the battlements. Now, go up to the battlements and walk to the mini- tower. When you get there, a switch will pop out of the floor. Pull this switch to open the inner door in the fort. Tip: there’s a platinum helmet somewhere on the battlements which will increase your armor class: see if you can find it! Now, enter the courtyard with the bell tower. Somewhere on the right is the entrance to the cave with the silver key. Be careful once you get the key, though, because another trap will be activated. The easiest way to get out is to step in front of the first crusher, and when it slams together, run forward against it. Once it opens, you’ll be running against the second crusher, and so on. This works because of the way the crushers are timed. This one is easy 🙂 Use the Silver Key you just found to get into the bell tower. Climb to the top and strike the bell (or shoot at it if you’re a mage). The bell will ring, and will cause the teleport inside the chapel to be opened. Now simply go back to the chapel and step into the teleport, which will take you to a small room with the portal leading to the next level, the Seven Portals. Stepping close to the portal opens a passage to the right that leads back to the front of the chapel. This level is a ‘hub’ level which leads to several sub-levels. To solve this level you need to solve puzzles in the sub-levels. For convenience, from now on I will refer to each of the seven gates in this level by a number. The first gate on the left as you enter the level is Gate 1, the second gate on the left is Gate 2, and so on, going in a clockwise order around the level. Each gate leads to a portal that takes you to one of three sub- levels. The first gate that you’ll open is Gate 2. This is opened by pulling the switch on the pillar in front of the gate. You need to kill the chaos serpents behind the gate and then step on the platform in front of the window. Two passages at the side will open, and a portal will rise in the icy room. This portal leads to the Guardian of Ice sub-level. The first room you see in front of you looks innocent… until you step into it. Well, you have to go through it, so go in and see what happens. After things calmed down, enter the doorway to the right which leads to a room with a lava pool. You’ll find a switch in a niche on the right side of the room. Pull it. Now go to the room with the lava pillar. There is a wall with a mask on it to the left. This is a secret door that leads to a long room with a bridge in the middle. There are lots of flechettes on the bridge. If you’re greedy for flechettes (like me), aim very carefully for the far end of the bridge and run across the bridge as fast as you can! Do not swerve to either side; you will drop to your death! When you reach the other side, clutch the door in fright until things calm down 🙂 Now jump to the narrow ledge on the left and carefully walk down the ledge until you come to a new opening that leads back to the room with the lava pool. Or, if you’re less confident, step onto the bridge quickly, and step back. You can now watch the fun without having to be in it. 🙂 Now, go back to the room with the lava pool. A new passage has opened. There is a switch in the newly-opened passage; pull it to open the door at the end of the bridge that closed when you stepped on the bridge. Walk along the ledge on the left side of the bridge room, and enter the door.Take the Flame Mask. Jump back on the ledge (I pity all you who are sacred of heights!) and go back to the room with the lava pool. That’s all you can do on this level at this point. Go back to the portal that leads to the Seven Portals. If you haven’t been to the Guardian of Steel yet, step into the portal in Gate 3 now. Otherwise, you can proceed to Gate 6. You start in a room that opens into a corridor with stairs on both sides. Each flight of stairs lead to a similar chamber with a switch and a fast door. Remember these two rooms: you need to fiddle with the switches later. For now, enter go to either room and enter the fast door. You will see two flights of stairs; one leading up and one leading down. Take the one leading up and you’ll get to what I call the central room in the Guardian of Steel. You get to this same room no matter which way you took. There are two doors here, besides the two flights of stairs. One of them needs the Steel Key: you don’t have it yet. So, enter the other door. This is an elevator. Another door opens when the elevator reaches the bottom. Go out and you’ll find yourself in a corridor. One end of the corridor will be blocked; go to the other end and you will see a room with a switch. Pull this switch. If you haven’t missed any switch so far, Gate 6 at the Seven Portals should be open. Again, you must kill all the Chaos Serpents before the portal at the far end of the room behind Gate 6 will open. Be careful on your way to the portal, though. Do not step on those bright patches on the icy floor! Those are traps. Or, if you’re good enough, run across them so that you won’t ever step into them accidentally again (don’t try this if you’re not fast enough though). Enter the portal, and you’ll find yourself in a new part of the Guardian of Ice. Go forward into the room in front and pull the switch. Now come back to the room where you started and pull two switches at the top of the stairs that were just raised. Some ettins will teleport in. Now, take the passage that leads to an open area on the left. There’s a room on the right. Enter that room (be careful of the trap in the room), and follow the passage. This will take you on a winding flight of stairs that has windows looking out to the open area you saw earlier. If you explored that open area and slipped and fell, there is an elevator that takes you up to this flight of stairs. Go the top of the stairs and pull the switch. Take the platform up and you’ll find yourself in the room behind the dark room where you first entered the Guardian of Ice from Gate 2. Go all the way to the room with the four pillars. Now two new bright arrows on the ground will be pointing at two doors which you can now enter. The door on the right leads to the room with the Fire Key. To get the key, place the Flame Mask on the wall on the far end of the room. This wall looks exactly like other walls with similar masks except that the mask is missing. Placing the mask there will lower the pillar with the Fire Key on it. The door on the left leads to a large icy room. If you’re playing a difficult level, run as fast as you can to the left corner of the room. Parts of the floor and ceiling will start to move. After a while, a switch appears in the corner where you have run to; pull this switch. More ice movements. The room now has deep crevasses in the floor; so be careful as you make your next moves. Go along the ledge on the left and jump into the next icy room. The Steel Key is resting top of some icy steps. Grab the key and watch out as the ice in this room begins rising and dropping too (a pillar of ice may even crush you if you’re standing on the wrong spot). Some enemies will appear. You can either kill them or flee back to the first room (be careful as you jump though!) Carefully make your way back to the entrance (you need good jumping skills here… the ice is slippery too!) Now get out of the room, and go back to the Seven Portals. Gates 5 and 7 are now open. Again, you have a choice of where to go first: Gate 5, which has a portal leading to another part of the Guardian of Steel, or Gate 7, which leads to the room with the lava pool on the Guardian of Fire. Now that you have the Fire Key, you can open the two doors in the room with the lava pillar. In either room, you will find a switch. Pull this switch and a platform lowers to ground level. Step on the platform and it takes you to the area beyond the lava river which is blocked by pillars (you can see this place vaguely from the room with the lava pillar). Kill the monsters here and the pillars on the lava river opens. If you ever need to get back to the room with the lava pillar this is the way out. But for now, go to the other side of the room where there’s a wall with a fire mask symbol on it. Two elevators will lower on either side of you. Step into one of them and you get to an area with several connected corridors. There is a teleport here, so step into it. This takes you to a room with a switch. Pull the switch. Note that if you open the walls with the fire mask symbol on them, you will get back to the place with the teleport. For now, go back to the room with the switch, and look behind where you teleported into the room. There’s a teleport symbol there: activate it and you’ll be taken back to the Seven Portals. If you’ve entered Gate 5 already, you’re ready to solve the puzzle on the Seven Portals. The new area on the Guardian of Steel where Gate 5 takes you is very similar to where Gate 3 takes you. However, this area is on the opposite side of the level. Again, there are two rooms with fast doors and switches. The stairs from these two rooms lead to the central room. Note that these stairs were blocked when you first came here from Gate 3; now they are open. Since you have the Steel Key now, open the steel door. Again, there is an elevator that takes you to a corridor. One side of the corridor is blocked; the other side leads to a room with a switch. Pull this switch and a message tells you to look for another switch. This other switch is in the room behind where the corridor is blocked. Now… you guessed it! One of the switches in the two rooms with fast doors will open this area. Go figure out which one it is, and pull the switch in the room. Now, something happens on the Seven Portals. If you have not been to Gate 7 yet, do it now. You have almost solved the puzzle! Go back to the Seven Portals. By now, three flight of stairs have risen (you may have noticed one before when Gate 6 opened. I deliberately delayed mention of it until now so that you can solve the puzzle all at once). The highest of them leads to a switch and a pair of Boots of Speed (your reward!). Pull this switch. This is one of three switches you need to pull to open Gate 4. The other two switches are at the top of the other two stairs. There are two switches at the top of each of these stairs. The ones that look like a cow’s head are the ones that open Gate 4; the other two switches open two doors on the Guardian of Ice. This is related to the secret level of this episode. After you pull all three switches, Gate 4 will be open. This opens the arena for the final encounter in episode one. Go inside Gate 4 and kill the monsters there. There is a switch beside the big doors at the far end of the room; pull this switch to open the doors. Beyond the doors you can see a portal on the other side of a huge chasm. This portal takes you to episode 2. But to get to the portal, you must first kill the centaurs. After they are killed, a magic blue bridge will appear across the chasm. Cross this transparent bridge (don’t worry! it won’t break 🙂 ) and the portal to episode 2 is waiting. There are lots of goodies around, so take a break from your slaughtering and collect the stuff around here. You find the first segment of your 4th weapon here, and there is a combined mana behind the portal. For those of you who are more adventurous and those of you who noticed something on the map: you can jump across the chasm to a narrow passage on the east side of the chasm (look at the map to make sure… “look before you leap!”). You get a close encounter with some chaos serpents on your way up the passage. At the top, you can find a pair of Wings of Wrath on a ledge. Jump down the ledge to get back to the area overlooking the chasm. If you’re paranoid about the magic bridge, you can use the wings to fly across the chasm. Or use them to explore some other area in this episode. Now, take a deep breath, brace yourself, and step into the portal, which will take you to Episode 2: Shadow Wood. Or, you may want to visit the secret level first, if you haven’t done so yet. To get to the secret level, you need to solve a few more puzzles on the Seven Portals. First, don’t forget to pull the switches on top of the two stairs on the Seven Portals (not the ones that open Gate 4, but the ones that give you a message that doors are opening on the Guardian of Ice). After you pull both switches, enter the portal in Gate 2 to go to the Guardian of Ice. Two doors have opened outside the dark room where you enter the Guardian of Ice. You can go to either room first, but I recommend the one on the right since the Afrits in there might sneak up on you from behind while you’re busy doing something in the other room. Go into the room on the right and get rid of the Afrits. Go down the stairs on the right and pull the switch. Fireballs will start to spew in the pit in the middle of the room. You need to run up the stairs and jump across the pit to the opposite side. There’s a switch the small room here: pull it, and a portal behind this small room opens. Now, jump back across the pit and go behind this small room. Enter the portal, which takes you to a new are in the Guardian of Fire. This is the room on the left. Don’t rush inside; as soon as you step in, the traps on the side walls activate. Time yourself carefully (notice the pattern that the balls of spikes are shot across the room) and go across to the end of the room. There is an icy room on the left with a pillar in the middle. The other side of the pillar has a switch you should pull. But don’t just stand there after pulling the switch! You’ll get poison darts on your back. You need to kill the centaurs that appear before the door of the room opens again. Leave the icy room and you’ll see a portal that just opened. Get your weapons ready, and your healing potions handy (yes, it’s a very nasty place inside there!) and step in to get to a new area in the Guardian of Fire. You start in a small room. The wall in front will open as you step in. Go into the room and follow the ledge on the left. Be careful on the way: there’s a wall here that will push you into the lava pit in the middle of the room: run fast to get past it. Now wait a moment and the lava in the pit will rise. Now, go to the pillar in the middle of the room and pull the switch. Jump back to the side of the room and exit the room. You’ll find yourself in the room with the lava pillar. If you haven’t been to the left room on the Guardian of Ice, or haven’t entered the portal there, go there now. If you have activated the switch on the Guardian of Steel, go back to the Seven Portals. The portal in the Traps Room on the Guardian of Ice takes you to an icy room on the Guardian of Steel. For those playing on high difficulty settings: have plenty of healing potions in hand, and run around and fire wildly as soon as you enter this place. After killing the Wendigos here, the walls will lower to reveal a larger room. You probably have seen this larger room from the central room in the Guardian of Steel. Unless you’re very, very expert in the game, don’t expect to kill the wendigos in the room (also, more will teleport in after you kill them, so don’t waste your energy): run for the elevators (look at the map to find out where they are) and get out before you get killed! The two elevators take you to the two rooms behind the fast doors. Now go to the other two rooms behind the fast doors and take the elevators there. This will take you to the other area you can see from the central room on this level. This place has a lot of crushers. Always time yourself carefully when crossing these crushers. Look for a switch somewhere inside here (it’s behind a crusher… look at the map to see where the switch is). Activate this switch. Now go back to the central room in this level. Some walls have opened in the area in the centre. Climb inside there, where there’s a torch on a dark pedestal. Jump on the pedestal and grab the torch. This triggers something, and you’ll get a message that stones are grinding on the Seven Portals. If you haven’t been to the right room on the Guardian of Ice yet, or haven’t entered the portal there that takes you to the new are in the Guardian of Fire, go there now. f you’ve pulled the switches in the Guardian of Fire and the Guardian of Steel, go to the Seven Portals. The area behind the highest stairs should now open. Go inside this area and jump into the water. There is an invisible portal here that takes you to the Bright Crucible. Note: there are many horrible monsters here; you should figure out a way of getting rid of them before you continue. When you start, you are facing SOUTH. Turn right (face WEST) and jump into the muck. Or, if you’ve already jumped down somewhere in the process of killing the monsters, go to the WEST side of the level. Step on the elevator in front of the ledge on the NORTHWEST wall (the one with the Chaos Serpent). Enter the tunnel behind the ledge, and keep going until you come to a room with spewing fireballs. In the centre of the room there’s a red object. Run into the room and grab it. This is the Heart of D’Sparil (for those of you who don’t know: D’Sparil was the first of the three serpent riders. He was the last boss monster in the game Heretic). The fireballs will cease once you picked up this object. Now, go outside to the EAST side of the level and take another elevator on the NORTHEAST ledge where a chaos serpent is. Go into the tunnel behind the ledge once you get up there, and follow the corridor all the way to the end, where there is a stained glass wall blocking entrance into a room spewing with fireballs. To get into the room, you need to barge through it; just shooting at it is not enough. Run against it, push it, and shoot at it (some combination of these) and it will shatter. Now unless you want to get burned by the fireballs, quickly place D’Sparil’s Heart on the stand in the centre of the room. The fireballs will stop. If you like, you can barge through the other stained glass wall too, which will take you up to another ledge where another Chaos Serpent was shooting at you. Anyway, after placing D’Sparil’s Heart on the stand, a long flight of stairs will rise from the muck in the south part of the level, all the way up to where you first teleported in. Also, a hidden area on the north side of the level has opened (behind where you teleported in). There are a few serpents in there, and you can also find an Icon of the Defender. Now, go down the long flight of stairs into the muck. Follow the flow of the muck and go underground. Here’s a portal that will take you back to the Seven Portals. Once there, time to go to enter the portal to the Shadow Wood. Basically, you are heading for the Hypostyle, which is the conclusion of episode 2. The portal to the Hypostyle is behind a gate inside the temple on Shadow Wood. There are three panels on either side of this gate. Each of the three pairs of panels have a different symbol: the Swamp symbol (green), the Horn symbol (yellow) and the Cave symbol (grey). Each panel corresponds to a switch somewhere on this episode which you must activate, and the symbol on the panel indicates which key is needed to get to the switch. So, there are two switches which need the Swamp key to get to, two switches which need the Horn key and two switches which need the Cave key. Every time you activate one of the six switches the corresponding panel will brighten up. This way you can monitor your progress in solving the puzzle. Once you find all these switches, the gate opens, and you will enter the portal to the Hypostyle. Here’s how to get to the temple on Shadow Wood and see the six panels: follow the left wall as you come out of the room where you start. Go through the doorway on the left and go up the stairs. This is the entrance to the temple. Go inside the temple, turn right and go to the end of the corridor. Open the metal wall on your left, and go down the corridor behind it. This leads to the room with the six switches and the gate. Since you haven’t solved any puzzles yet at this point, the six panels will be dark (you need to walk up to a panel to see the symbol on it if it hasn’t brightened up yet). OK, that’s enough introduction. Time to actually solve the puzzles. Since you need the three keys in order to get to the six switches, you have to first find the keys. The Horn Key is in the Wastelands. You need to first open the portal that takes you there. So, in Shadow Wood, go to the place where there is a deep, deep drop and a narrow ledge. This is somewhere beside the river. Now you need to carefully jump from ledge to ledge. Keep going until you reach the end, where there is a switch (practice your jumping skills here! Or, save your game a lot because it’s very easy to slip and fall to your death). Pull this switch. It opens a wall somewhere along the narrow ledge you have just passed, so start jumping back (have fun). The portal to the Wastelands is behind the wall. Also, another wall opens to the main area in Shadow Wood. If you go there, you’ll find that yet another wall has opened to reveal lots of ammo and healing potions. You probably need this before you enter the Wastelands. Now, brace yourself and step into the portal. In the wastelands, go down the steps to the exit from the sad- looking area where the portal took you. If you look down the exit, this is SOUTH. It’s very easy to get lost here, so keep your map handy. I’ll be using the compass a lot. The exit leads to a ledge with brown serpents on an opposite ledge. Be very careful in this level; avoid standing on those piles of dirt on the ground… Now take the descending passage on the left and this takes you to the area between the two ledges. Enter the tunnel on the left (EAST). The tunnel will fork into two; take the right one. This goes on for quite some time. As you go on, watch for an exit to the right (SOUTH) — you may miss it if you’re not looking. This exit leads to what I call the Two Portals room. It has a closed portal and a blocked teleport. You need the Cave Key to open these two; if you don’t have it, go back to the tunnel and continue down the tunnel. This time, keep an eye on the LEFT (NORTH) wall. Somewhere along the way you’ll see a square wall with a different texture from the tunnel walls. If you reach an open area before you see this, you’ve missed it: go back into the tunnel and look for it. This square wall is a revolving door. Open it and enter. Watch for the brown beastie waiting on the other side, though. Go up the winding path to a big open area. Go left (EAST), and you’ll find a narrow walkway with lavaon both sides. Go to the end of the walkway and you’ll find the Horn Key. Note that once you get the key, the walkway breaks into pillars. You must jump from pillar to pillar all the way back if you don’t want to fall and get burned by the lava. If you ever fall into the lava, simply follow the walkway until you reach the beginning, and pull the switch. This lowers a platform to take you out of the fire. If you’re following my order of getting the keys, go back to Shadow Wood now (retrace your steps through the tunnel, and back to the starting room). Go to the river in Shadow Wood, and walk downstream. Don’t worry if you see a wall ahead; it will open. Go all the way until you reach metal bars that block your way. There are stairs to the left which lead to a high cliff with a green swamp below. There is a tower in the middle of the swamp; run and jump onto the base of the tower. Pull the switch there. This will raise several metal pillars on the sides of the swamp. Now, jump into the swamp and look for a switch on the wall. Pull this switch. This opens the metal bars blocking the river, so now you can jump back to the river. Climb up the stairs again, and this time, turn left and jump on the pillars you just raised. These pillars lead to a high area where the chaos serpents were firing at you earlier. Don’t panic if a poison dart hits you; it’s almost unavoidable. Of course, don’t get hit by too many darts, otherwise your life may get too low. There’s a switch on the high area that raises steps to go up the tower. Jump to the base of the tower (don’t drop down to the swamp; it’s just a little too high and you’ll get hurt). Now climb up the tower and pull the switch. Now the portal beside the swamp is open. This portal takes you to the Darkmere. Smash down the rotten trees in front of you when you first enter the Darkmere. Enter the building and go to the room flooded with muck. Now, look for a piece of furniture that is different from the rest (you can find out what it is yourself, I won’t spoil the fun here). Go up to it and activate it. This opens the door next to it. Activate the switch behind the door, and the other door in the room opens. Enter the door, and go left. At the end of the corridor, open the door and activate the switch inside. Now go back and take the corridor opposite the door. The first switch has opened a room here; go inside and activate the switch. Now go along the last corridor which leads outside to the swamp. Go into the porch of the small building here, and activate the switch there. If you look into the window, you’ll see the Castle Key which you need in order to get to the Swamp key. However, the door to the building is not open yet, so follow the current of the muck and you’ll get to a big open area with a castle. Don’t drift with the current now; the muck flows into a very deep chasm and you’ll get killed by the fall. Go to the front of the castle and pull the switch. This lowers the bridge into the castle. Don’t fall off the bridge as the monsters come charging out! Go inside the courtyard, and look for the room with a well. Jump into the well and activate a switch. This raises the water level so that you can get out again, and at the same time, it opens the door in the small building with the Castle Key. You need the Castle key to open the room at the top of the tower in the courtyard, so go get it now. Climb up the tower and open the door. There is a hidden switch here: see if you can find it! Hint: vandalize the room! (ie., smash everything you can). This switch opens the door to the lower level of the castle. Go to the lower level of the castle (the entrance is somewhere in the courtyard of the castle), until you get to what looks like a dining room. Note: if you have the Horn Key, you can reach one of the six puzzle switches from here. Now, look for where a fireplace is supposed to be but isn’t. Open the secret wall behind, and a secret passage will be revealed. Go along the passage and pull the switch at the end. This lowers an elevator that takes you to the room with the Swamp Key. As you approach the key, walls will rise and block you, and the masks on the wall starts shooting poison darts. You cannot avoid getting hit by the darts, so run as fast as you can along the zig-zag walls to minimize the damage. Now get the swamp key. The walls will re-arrange to form three rows, two rows with fireballs spewing from the ground and the last row with the poison darts trap. One of these rows is the one you must run through to get out; if you run through the other two rows, you’ll be teleported back to where the Swamp Key was. (In a previous version of this walkthrough I thought the leftmost row was always the right one, but it’s not; it’s chosen at random. Sorry for any confusion caused or any guts spilled 🙂 But I still don’t know how to find out which is the correct row, other than running through all of them. Please tell me if you know.) If you’re following my order of getting the keys, go back to Shadow Wood now, using the portal beside the small building with the Castle key. The Cave Key is in the Caves of Circe. Go to the temple in Shadow Wood, to the room with the six panels. If you look at the map, you’ll notice that there are two passages that lead to this room from the front of the temple. Go to where the north passage enters the room. Walk in front of the black mask there. This activates many traps in the temple, and also raises stairs in the front corridor. Run back to the front corridor and go up the new stairs that just raised. (This is north of the entrance to the temple.) Be careful! Don’t fall of the last step: you need to jump (actually running will do) into the opening on the right at the top of the stairs. This goes into the room where the chaos serpents are, which overlooks the room with the six panels. Go to the centre of the room and look for a small manhole near the west wall. Jump inside and pull the switch. Now, go back to the opening at the top of the stairs where you came in (not the other opening which also leads to another part of the temple’s front corridor). The switch you just pulled has lowered the stairs below ground level. Jump down and go to the bottom of the steps. There’s a secret opening here which shuts behind you as soon as you enter it. Don’t worry; follow the short passage into a large room with lots of goodies. Hold it there! Don’t be greedy! Carefully step into the room and stop. Floors and ceilings will start to move; some pillars will crush down from the ceiling. Deep pits will form in the room. When things have calmed down, you can follow the right ledge, which will lead you to a room with the portal to the Caves of Circe. Alternatively, follow the left ledge (you need some jumping around for this route), until you come to a switch on the wall. Activate this switch, and the deep pits will be removed, partially restoring the room. (Thanks to Michael W. Daniels for telling me about this switch!) Now you can walk around the room and collect the goodies here. After collecting the goodies, look for the room with the symbol of Korax and step into the portal. Turn right when you enter the Skylight Cave, and jump into the hole at the end of the passage (or fall into it if you didn’t see it!). This is a small cave that opens out to a corridor. Go out on the corridor and turn right. Take the first left turn. This takes you to what I call the Middle Cave. The Cave Key is here. Go straight along the Skylight Cave. The passage will take you to what I call the Lower Cave, which has a pool in the middle and dripping water. Turn right and follow the passage there. Take the left turn when it forks. Now you are in the Middle Cave, where the Cave Key is. There are also ascending stairs from the Lower Cave that lead directly into the Middle Cave. (I leave it to you to figure out the other interconnected passages around here). Note: if you have the Horn Key, you can reach one of the six puzzle switches from here. If you have the Swamp Key, you can also get to another puzzle switch from here. Go back to the Ettin Cave. This time, take the right exit. You’ll get to a cave with a bright open area at the far end overlooking a deep chasm (this is not the pit with water flowing down the sides). Walk along the ledge on the left, and make your way across the chasm. There’s a Porkalator along the way… see if you dare to get it 🙂 At the end of the path, there’s a room with some goodies and a teleport. This teleport takes you to where you started when you came to the Caves of Circe. Step into the portal there that takes you back to Shadow Wood. To get out of the room under the temple in Shadow Wood, find a switch in the room. This lowers an elevator that takes you back to the main floor of the temple. Now you can get out. Go to the Dining Room in the castle at the Darkmere (see the directions to get to the Swamp Key). Look for a switch hidden in one of the fireplaces (don’t worry… the fireplace doesn’t burn you for some reason). Pulling this switch opens a secret flight of stairs behind the fireplace. Go to the top of the stairs and enter the revolving door with the Horn Key. Climb up the steps that lead to a ledge opposite another ledge with a portal. The puzzle switch is on the wall. Go to the Skylight Cave in the Caves of Circe (see directions on getting the Cave Key). If you got here from the Ettin Cave, go straight to the end of the cave and follow the passage. Look for a partially hidden exit on your left. Climb up the narrow steps, and open the door at the top with the Horn Key. There’s a portal inside here that takes you to the Wastelands. The puzzle switch is on the wall beside the portal. Go to the Two Portals room in the Wastelands (see directions for getting to the Horn Key). Use your Cave Key here to open the portal and the teleport. Step into the teleport (not the portal!). This takes you to a room with a lava lake. Kill the Afrits and walk around the lava. A magic bridge will appear. Climb up the bridge (careful at the turns). Go inside the room at the top and pull the puzzle switch. Note: some people have written me about problems with gaps in the magic blue bridge. Here, I’ll point out that for almost every magic blue bridge in the game, there’s a small gap between the floor and the bridge. If you walk too slowly, there’s a chance you might ‘slip through’ the bridge. Also, I encountered similar problems on this particular bridge before, where the first step doesn’t appear. The solution here is to jump on the second step. Now, go down the bridge and enter the exit at the bottom. Climb up the passage to the top and open the door using the Cave Key. Go to the Middle Cave in the Caves of Circe (see directions for getting the Cave Key). Look for a passage that goes upwards (there is only one that goes up). Note: be careful of pits in the floor here… unless you like close encounters with hungry monsters. This passage leads to the Upper Cave. Don’t be greedy! Resist the temptation to get the platinum helmet in the corner (you won’t like the consequences). There’s a fast-flowing river on the left. Beside this river is a door that needs the Swamp Key. Open it and climb up the passage. Take the first left tunnel, which leads to a room with the puzzle switch. The other tunnel leads to a portal that takes you to the Darkmere. Go to the Wastelands (see the directions for getting the Horn Key). Go SOUTH to the place with the serpents on the opposite ledge. This time, take the RIGHT (WEST) tunnel (you went to the east tunnel to get the Horn Key). Along the way, you’ll see a grey tunnel on the left. If this is not open yet, go kill some monsters. (I’m not sure which monsters — maybe the ettins in the open area at the end of the tunnel. If you know, please tell me.) Once this is open, go along it and take the right tunnel when it forks. (the left tunnel leads to the ledge with the serpents. There’s a Krater of Might on the ledge). Now you’re in a long, winding path with centaurs. Keep going until you reach a place where the path splits into three (this is after a dead-end tunnel on your left). Kill the centaurs here and a large swampy area opens nearby. Go to the far end of the swamp and climb up the stairs. Open the door with your Swamp Key. Go inside and pull the switch in the farthest room. This opens a large temple-like place near the swamp. (The long path with centaurs is actually the perimeter of this place; this switch lowers the entire right wall of the path to reveal it.) Go up the stairs to the main door in this temple-like place. Open the main door. (Hint: you may need to push it hard and try to open it at the same time). Go inside the building and go behind the portal. The puzzle switch is there. Now, you have solved the puzzle of the six switches on Shadow Wood! Brace yourself, and go to the room with the six panels in the temple on Shadow Wood. All six panels should be bright now (if not, you haven’t pulled all six switches yet — pull them first!). The gate to the portal should now be open. Take a deep breath, get your weapons ready (yes, you’re not done yet!) and step into the portal. This is the one with many chaos serpents. Go to the far end of the room, and activate the switch there. Come back to the door (which closed when you entered the room), and pull the switch in front of it. This lets you out of the room and opens a door to another room. Look at the star to find out where this next room is. Note: if you’re playing the fighter, the second part of your fourth weapon is in this room. This is the room with many centaurs a many crushing pillars. Go to the left side of the room and press the switch behind the wall. (Monsters will teleport in.) Now go to the right side and press the switch behind the wall there. (More monsters.) Now go to the end of the room and press the switch there. This lets you out of the room and opens the next room. Again, look at the star to find out which is the next room. Note: if you’re playing the cleric, the second part of your fourth weapon is in this room. This is the room with many moving pillars on a lava lake (Not the one with the bridge; I call that the Bridge Room). You can jump from pillar to pillar to get to the end of the room where the switch is, or, go down the steps to the edge of the lava, and wait until the last pillar is almost fully down. Run across the lava and get on the pillar before it rises out of reach. Now you can jump to the ledge with the switch. This switch lets you out of the room and opens the next room. Note: if you’re playing the mage, the second part of your fourth weapon is in this room. Be careful of the ground where the fire-breath of the Wyvern hits, because his fire has secondary explosions which occur after one or two seconds after the initial impact. You’ll get burned if you step on the ground too quickly where his fire hit. To get to the Sacred Grove, you must first solve all six puzzle switches on episode 2. Once all six switches are activated, the hidden portal to Sacred Grove opens. First, kill all the ettins that come charging at you as soon as you enter the level. After you kill them, something opens at the base of the pillar in the centre of the level. Go to the pillar, and look for a switch. Pull it. This switch is the one that Raven said will trigger something several levels ahead. It activates something in the Forsaken Outpost, which is in Episode 4. You must pull this switch if you want to get to the secret level in Episode 4. There’s nothing much else to do here, except to drool over with the goodies here. Sacred groves are pretty boring places 🙂 so step into the portal, get back to Shadow Wood and continue with your quest. Once you finished all tasks on the Shadow Wood, time to enter the portal in the Hypostyle and travel to the Heresiarch’s Seminary. Welcome to the Heresiarch’s Seminary! You’re going to have a really bad nightmare here (especially if you play the hardest difficulty setting). Anyway, the main emphasis of this walkthrough is the puzzle, so I’ll skip the horrific superlatives and tell you about the puzzle in this episode. In the main hall in the Heresiarch’s Seminary, there’s a chart with circles and triangles on the wall. This is some kind of astrological chart with a symbol for the sun in the centre. You can also see a little red gem on the lower left corner, representing one of the planets. Five other spots for other planets are scattered across the chart, except that the gems representing those planets are missing. Your goal is to find these missing planets and fit them on the chart. Before you start looking for the missing planets, you first need to get into the Seminary. The portal from the Hypostyle in episode 2 takes you to a tower in front of the Seminary (as the story tells you). Take the elevators down and enter the Seminary, which is very, very dark at this point. (Watch out for the Dark Bishops!) You need to enter some distance into the Seminary, and then a small earthquake occurs and the lights in the hall will light up. The chart with the missing planets are on the other side of the wall facing the entrance to the Seminary. There are stained glass walls on the northeastern and northwestern corner of the Seminary. Go and smash these glass walls and pull the switches behind them (there should be six switches). This opens the corridors on the northeast and southeast corners of the Seminary. Go down the northeast corridor that just opened in the Seminary. At the end of the corridor, there’s a switch on the wall on the left. Pull this switch, and quickly run to the far end of the corridor, and jump on the elevator that is lowering. You have to get on the elevator quickly, otherwise it’ll be too far down and you’ll get hurt jumping on it. In some difficulty settings, there may be a nasty surprise waiting for you when the elevator reaches the bottom, so prepare your weapons… At the bottom, you’ll see the portal leading to the Silent Refectory. The switch on the wall is to lower the elevator so that you can get out when you come back from the Silent Refectory. From where you start in the Refectory, turn right and go south. Jump up onto the box in front of you, and turn left (east). Go straight and jump into the corridor. Now turn right and go south. When you reach the stack of boxes in front of you, follow the right side of the boxes (you should be going south here). When you reach the wall, turn left and look into the dark area. Pull the switch inside there. Now go east, around the boxes hiding the switch, and stairs should have lowered. The portal at the bottom of the stairs takes you back to the Heresiarch’s Seminary. Don’t enter the portal now; go to the room behind the portal where the Dark Bishops are. There’s a switch on the raised walkway at the far end of the room. Pull this switch, and a small area behind the portal opens. One of the Emerald Planets is on the shelf inside. Go to where the portal is and climb up the stairs. Now turn right and go all the way until boxes block your way. Turn right, and you should see a stack of two boxes marked with some symbol. Jump on the boxes on your right (south of you), and go inside the dark area. The switch inside here lowers the pile of marked boxes I just mentioned. Pull the switch and quickly climb out of the dark area. Jump into the hole where the marked boxes have lowered (of course, if you prefer to shoot at the slaughtaurs from above, you can always go pull the switch again when the boxes rise up.) Climb up the spiral staircase, brace yourself (you can guess what’s coming…) and pull the switch at the top. If you survive the surprise (find out what it is yourself 🙂 go back to where the marked boxes are and activate it. The boxes will lower. Step on it and it will take you back to the area with many boxes. After you step off the marked boxes, go west and turn right (face north). Climb over the box in front of you and go all the way to the northern wall. Turn left and jump on the box that’s also marked with a symbol. Walk on the boxes into the small at the back, and pull the switch there. (If I’ve lost you, this switch is on the northwest corner of this storage area.) Now, a door is open on the northern wall next to the marked box. Go into the room behind this door, which has windows looking into some kind of dining room. Enter the dining room and go to the southern end. There should be an opening here (the switch you pulled in the room with the spiral staircase opens this). This opening leads to an ascending passage which has windows looking into the room with the spiral stairs (you’ve probably been shot at from here when you were in that room). At the end of the passage there’s a switch that opens a door on the east side of the dining room. Pull the switch, go back to the dining room and enter the opening on the east side. There’s a large pillar rising from the pit in the middle of the room. When you approach the edge of the pit, the pillar begins to open, and reveal a Sapphire Planet on a smaller pillar inside. To get the Sapphire Planet, aim carefully and jump onto the pillar. Don’t panic! The pillar will start to lower when you jump on it. (I guess this is for those who missed and fell into the pit). Just wait a while and it will rise again. Jump back out, and return to the dining room. As an aside, go to the northern wall of the dining room and push the wall with a purple dot a the top (push, ie., walk against it). If you push far enough, you’ll see a small hole on the right with an item in it (Banishment Device). That’s all for the Silent Refectory. Now it’s time to go to the Orchard of Lamentations. Note: if you go to the room with the lava pool, notice that one of the dark openings is taller than the rest. This is a hidden passage that leads right back to where you first enter this level. Go to the portal now and get back to the Heresiarch’s Seminary. Go down the southeast corridor in the Seminary. Look for a switch on your right (before you come to the end of the corridor). Pull this switch, and turn around. After a short pause, the stairs you just came down on will lower, revealing a secret passage on the south wall beside the stairs. Go inside this secret passage, and climb up the stairs. Kill the Dark Bishops here. The southern wall of the room will open to the area outside the Seminary. Now, a similar room will open on the other side (the WEST side) of the Seminary. Go west (outside the Seminary) and enter the room there. Go down the stairs, and follow the zig-zagging passage. Note that this passage is magical; after going along it for a distance you’ll find yourself on the ledge at the east side of the Seminary, at the end of the southeast corridor, where the slaughtaurs are. (Actually what happened is that in the middle of the zig-zagging passage there is an invisible teleport that warps you to a similar passage behind the ledge where the slaughtaurs are.) There is a switch on the ledge; pull it, and a door will open on the wall in the area below the ledge. The portal behind this wall takes you to the Orchard of Lamentations. Don’t worry, I didn’t make a mistake. There are two Emerald Planets and two Sapphire Planets. In fact, there are two Ruby Planets too, except that one of them is already on the chart, so you only need to find the other one. So, now, in the Orchard, follow the path from the portal (there’s nowhere else to go). Be careful of the muck here (you know why). You’ll reach an area with slaughtaurs on two high ledges. Go further, and go down to the roundish area with ettins, slaughtaurs and quite a few poison mushrooms. Go down the stairs on the south side of this area. Now you have to be very, very fast in making your moves. Pull the switch which lowers the platform at the end of the path. Quickly jump down and run as fast as possible to the nearest corner, before the entire floor rises and crushes you to death! Now you’ll be in a small room with a switch that lowers the floor again. Your goal is to reach the middle, southern room in this place (look at the map). You do this by pulling the switch in each of the rooms and going quickly from room to room as the floor lowers and rises. When you reach the middle, southern room, there should be two switches. The switch on the east wall opens the central room in this crushing-floor area (look at the map and you’ll know what I mean). Once this is opened, you can reach it from any of the seven rooms. There are also two switches in this room; one of them activates something on this level, and the other lowers the floor so that you can get out. Once you pulled the switch, lower the floor and run to the north side where the exit is. Go back to the area with the slaughtaurs on the two ledges. The high place on the east has lowered; climb all the way up until you reach the slimy river at the very top. The Emerald Planet you’re looking for is near the edge of the slime-falls (don’t fall though, it hurts). Go to the raised ledge in front of the slimy river. You should be able to see one of the ledges with the slaughtaurs. Now, aim carefully, run as fast as you can and jump onto that ledge. If you can’t make it, keep trying! (Hint: holding down your jump key longer helps.) Once on the ledge, enter the misty passage behind it. This is a magical passage similar to the one in the Heresiarch’s Seminary: it teleports you somewhere along the way to a similar passage that leads into the west side of the area with the four paths. If you’re greedy, or feel like bashing up some baddies, notice that the northern wall here has opened. Get your weapons ready, and go grab the porkalator. Monsters will appear at the sides where two other walls will open. Whether you’re greedy or not, notice that the east side of this area is also open now. Go down the stairs into the misty passage. This is another of those magical passages. It teleports you to the other ledge with the slaughtaurs. The Sapphire Planet is here. Grab it, and jump down the ledge. There’s nothing much else to do here, so go back to the portal and return to the Heresiarch’s Seminary. This is an aside… but since finding the parts of your fourth weapon is also a puzzle, I guess I’ll include this one as well. At this point, you should have found the first two parts of your fourth weapon. Go to the end of the southeast passage in the Heresiarch’s Seminary. There’s a switch here that you must pull: see if you can find it! (no, it’s not the one on the ledge that opens the portal to the Orchard of Lamentations.) Hint: remember the first thing you did when you entered the Darkmere in Episode 2? (Remember what those trees looked like??) This switch will start rotating the four doors along the passage. Two of these doors lead to the ledges with the Chaos Serpents overlooking this area. The door we’re interested in here is the southwestern one. Another aside… (if you’re itching to solve the puzzle, you can skip this section). So, you’re greedy to get the Icon of the Defender. Well, go through the northwestern door on the southeast passage in the Seminary (see the previous section). This leads to a U-shaped passage that goes around the area with many Chaos Serpents (you’ve probably seen them through the window from the main hall of the Seminary). At each end of the passage there’s a wall with a purple gem at the top. Activating either of these walls lowers elevators around the passage that takes you right into the room with the Chaos Serpents (have fun!). The Icon is on the water in the middle of the room. Go to the chart, select a planet, and use it on the chart. You should be able to figure out which planet belongs where on the chart: the game won’t let you put a planet in the wrong place so just try another spot if it says “you can’t use this here”. Before you go on, check that you’ve fitted five planets on the chart. There should be six planets on the chart now, including one of the Ruby Planet that was already there before. Once you’ve fitted in all the planets, go to the north part of the Seminary where the magical area is. Doors will open on the side walls and on the wall behind the area. The door behind the magical area leads to a room with three portals and nine panels on the wall. Now, it’s time to solve the next puzzle in this episode: the puzzle of the chapels. You should have reached the area with three portals at the northern end of the Heresiarch’s Seminary. If you look at the south wall, you’ll see nine dark panels. Just as in Shadow Wood, each of these panels corresponds to one of the nine puzzles you must solve in the chapels. Each of the three portals lead to a different chapel. The portal with the symbol of a wolf leads to the Wolf Chapel; the portal with the dragon head symbol leads to the Dragon Chapel, and the portal with the griffin leads to the Griffin Chapel. Note that each chapel has three portals, each leading to the other two chapels and the Seminary. As you guessed, those portals also have the corresponding symbols on them to indicate where they go to. The portal leading to the Seminary has no symbol on it. The three chapels are quite intricately connected with each other; pulling puzzle switches in one chapel may open new areas in other chapels. This can become very confusing; so I recommend that you simply solve the nine puzzles in the order that I present them. This time it’s not the best way of doing things though. In many places you can solve more than one puzzle without leaving the chapel, but for the sake of neatness, I’m doing things the long way. Of course, for those of you who want to do things your own way and don’t mind getting confused, 🙂 I’ve included many cross-links in this document. Go to the Griffin Chapel. There are two cages with Chaos Serpents on the northwest and northeast corners of the hall here, as well as another cage with another Chaos Serpent on the south side. On the south side, there are two staircases on the south, with really high steps. These are blocked with bars unless you’ve solved the first puzzle in the Wolf Chapel. If you did, you can solve the second puzzle in this chapel. There are also bars on the north side, which leads a deep chasm. If you’ve solved the first puzzle in the Dragon Chapel, you can solve the third puzzle in this chapel. two pillars next to the two Serpent cages in the hall. The switches inside these pillars opens the cages. the door on the north side of the hallway in the Wolf Chapel, which leads to the second puzzle in the Wolf Chapel. the northern pair of rotating pillars on the west side of the Dragon Chapel, which leads you to the second puzzle switch in that chapel, and also open the bars blocking the northern passage on the east side of that chapel. Go to the Wolf Chapel. The portal takes you to a small room with the three portals, outside the chapel building. Go to the southwest corner of the level, where there’s a small staircase leading to a door in the building. Go inside and pull the switch inside. This switch opens the door on the south side of the building, which leads to long hallway. If you’ve solved the first puzzle in the Griffin Chapel, you can solve the second puzzle in this chapel from here; and if you’ve solved the first puzzle in the Dragon Chapel, you can also solve the third puzzle. open the bars blocking the staircases with high steps, in the Griffin Chapel. This leads to the second puzzle in that chapel. open the southern pair of rotating pillars on the west side of the Dragon Chapel, as well as the bars blocking the south passage on the east side of that chapel. This south passage leads to the third puzzle switch in that chapel. When you first enter the Dragon Chapel, beware of the crystal vials on the ledges at the sides of the room. If you decide to grab them, be ready for a nasty encounter. Also, watch out for slaughtaurs inside the main hall of the chapel: there are many of them here. There’s a circle of unlit lamps in the front of the hall. If you’ve solved the first puzzles in the other two chapels, the lamps will be lit, and a Krater of Might will teleport into this circle after a while(how nice!). Go up the steps leading to the swamp pool, and go grab the goodies behind the pool. Kill the Dark Bishops that appear. Now two doors have opened on the east and west sides of the hall. Be careful when you enter one of these doors, because monsters behind the other door will be sneaking up behind you. The east door leads to a short corridor with two passages on the sides, the northern passage and the southern passage. These will be blocked with iron bars unless you’ve solved the first puzzles on the other two chapels. If you’ve solved the first puzzle in the Wolf Chapel, you can solve the third puzzle in this chapel from here. a door on the east and a door on the west side of the hallway in the Wolf Chapel. The west door leads to a series of dark corridors and a room with the third puzzle switch in that chapel. The bars on the north side of the hall in the Griffin Chapel, which leads to a huge pit with lava at the bottom (yes, I was stupid enough to jump down just to see what’s at the bottom!) This place leads to the third puzzle switch in that chapel. To solve the second puzzle in the Griffin Chapel, you need to solve the first puzzle in the Wolf Chapel. This opens the two staircases on the south side of the hall in the Griffin Chapel. Go to the Griffin Chapel, and down the stairs on the south side of the hall. Climb up the passage on your right. This leads to an open area with a deep chasm on either side of a walkway. Walk to the end of the walkway where it widens out into a round ledge. When you walk here, a trigger is activated. This is the second puzzle. Across the chasm on the east side, there’s a stained glass wall. If you break the stained glass, a wall will open on the west side across the chasm. This leads to the room with the Porkalator, in front of the ledge. Note that this stained glass takes good aim to break. Switch weapons if you can’t break it, some weapons don’t seem to work. To solve this puzzle, you must first solve the first puzzle in the Dragon Chapel. This opens the bars that lead to the huge pit with lava at the bottom. If you noticed, there’s a small black arrow on the floor pointing at the pit. Now, take a deep breath, and walk over the edge in that direction! Presto! a magic blue bridge appears at your feet, leading to two openings across the deep chasm. If this doesn’t seem to work for you (ie., you fall into the chasm and die when the bridge appears, or it doesn’t appear at all), note that: you must walk over the edge, not crawl like a coward. There’s a small gap between the edge and the bridge; if you crawl too slowly, you’ll fall through the gap to your death. Also, you must walk off the edge exactly where the arrow is. If you walk off elsewhere, you’ll miss the bridge and die (or the bridge may not even appear). Now go to the opening on the right first, and press the switch there. This will open the bars that are blocking the opening on the left. After you press the switch, go to the opening on the left and enter the teleport. This teleport takes you to the southwest corner of the chasm, near the bottom. Follow the narrow passage and jump across the small section of the chasm. The passage on the other side leads to what I call the Crazy Walls Room. There are many walls in this room that move back and forth. If you’re not careful, you’ll be crushed between moving walls! The puzzle switch is at the far end of the room. But don’t run there yet! If you do that now, the ceiling wall fall on top of you and kill you. You must first find four switches in this Crazy Walls Room. The switches are behind walls with a purple diamond at the top. They are located near the four corners of the room. Note: Several times when I played this level I had problems with walls that seemed to be stuck, and in places close to these walls I seem to be able to “see through” them (DOOM level writers call this the Hall of Mirrors Effect). The reason seemed to be that some ettins are stuck between the walls, and for some reason — I think it’s a bug — the walls cannot move and this causes the wall-moving script to malfunction (my guess). This is especially irritating when one of the four switches are behind the stuck wall! The way to cure this bug is to either kill the ettin and quickly move out of the way before the wall crushes you, or use the Disk of Repulsion on the ettin. For some reason this kills it, and the walls go back to normal. Also, when saving in this room while the walls are moving and then reloading the game can cause problems. After you have activated all four switches, go to the end of the room where the puzzle switch is. The ceiling won’t fall down now. After you pull the switch, the “Crazy Walls” move into some fixed position and then stops moving. You must solve the first puzzle in the Griffin Chapel before you come here; it opens the north door in the hallway in the Wolf Chapel. There’s a long corridor behind this door. Be careful of the stained glass walls and ceilings. They’ve unexpected surprises for you! Solving this puzzle also raises the floor where the triangular symbol is marked. Now you can jump from this raised floor onto the small ledge with the Krater of Might. The switch that solves this puzzle is in one of the rooms in the dark corridors on the western part of the Wolf Chapel. If you have solved the first puzzles in both the Dragon Chapel and the Griffin Chapel, you can enter the Wolf Chapel using the west entrance. From there, enter the first door on the right. Otherwise, go to the main hallway of the Wolf Chapel and enter the door on the west, where there’s a room with a deep pit with a pillar in the middle. (I still don’t know what this pillar is for. If you know, please tell me.) Enter the door on the left, which leads to dark corridors. Go left when you enter the door, and go inside another door on the left. Now you should be in the room with two pillars and some Dark Bishops. The door on the opposite side leads to a room with the puzzle switch. Once you pull the puzzle switch, four platforms at the corners of the room will lower, with some ettins on them. The two pillars in the first room will also lower, with some Dark Bishops on them. One of the platforms will rise when you step on it, and will take you to a small secret room with an Icon of the Defender. For those of you who are adventurous, you might want to try exploring other rooms along the dark corridors. There’s a room with something that looks like a fireplace. Anyone knows what this is for? There’s also a room which has three raised ledges with Discs of Repulsion on them. Each time you take the Disc, the ledge lowers into the floor. Once all three have lowered, Dark Bishops will teleport into the dark corridors outside. By the way, the map seems to show that there’s a door from this room into one of the side rooms in the long hallway with stained glass, but I can’t get it to open. Anyone has any ideas? Please tell me if you know anything about this. To solve this puzzle you must first solve the first puzzle in the Griffin Chapel. This opens the northern pair of rotating pillars in the Dragon Chapel. If you haven’t solved the first puzzle in the Dragon Chapel yet, do it now. Go to the west corridor where the rotating pillars are (this is also where the first puzzle switch is). Go past the northern pair of pillars. There’s a wall with a dragon symbol on it. You need to open this door by pulling a switch upstairs. Turn right and activate the wall where the texture is different. This lowers an elevator which takes you to the ledge where a slaughtaur was. There’s a wall with a dragon symbol on the left: open it and go up the stairs. Now you are on the high ledge in the northwest corner of the chapel. There’s a switch near the edge. Pull this switch and the door downstairs that I mentioned will open. Now go back down the stairs and jump down into the main hall of the chapel. Note: don’t jump down straight from the high ledge. You’ll get hurt. Now go back past the northern pair of rotating pillars and go through the door that just opened. Go all the way to the end and pull the switch there. This is the second puzzle switch. If you look through the window here, you’ll see a swampy pool with lots of goodies. You can get in there from the main hall of the chapel outside. Go to the swamp pool and strike the northern wall (strike, not open). This lowers the pool into this area behind the window. You should solve the first puzzle in the Wolf Chapel before you come here. When you solve the first puzzle in the Wolf Chapel, the bars blocking the south passage on the east side of the Dragon Chapel will be opened. Go to the east corridor and down the south passage. Activate the wall with the dragon symbols. This is an elevator that takes you to the highest ledge in the southeast corner of the chapel. From there, jump down to the lower ledge on the north (not back into the main hall!). A wall will open on the right, with some baddies. The switch inside is the third puzzle switch in this chapel. So, you’ve solved the puzzle of the three chapels. Now, go back to the Heresiarch’s Seminary. All nine panels on the wall should be bright by now. Pull out your best weapons and go into the main hall. The battle begins! You must face the Heresiarch before you can get out of this place. Although this document is supposed to concentrate on the puzzle side of the game, I think a few tips on fighting the Heresiarch should be included here since it’s an important juncture in the game. The Heresiarch has several modes of attack: he can fire a wavy trail of large purple fireballs that are extremely damaging (they explode, too, so stay away from them even when they miss you and hit the floor), or he can summon bouncing blobs of fire that chase you. These blobs of fire look like skulls and stay around for quite a long time before they disappear, if they don’t hit you. When the Heresiarch is badly hurt, he’ll also summon Dark Bishops to help him. Note that the Heresiarch can freeze into an invulnerable mode (when he has those purple swirly things around him, not necessarily when he raises his arms — thanks to Arne for correcting me on this point). In this mode, all attacks are blocked, and most magical weapons are actually reflected back at you. Since you should have an ample supply of quartz flasks by this time, just ignore the homing bouncing fire blobs (they don’t cost too much life); concentrate your attention on attacking the Heresiarch. Stay away from the purple fireballs, though. These may drain too much life and exhaust all your healing potions. Don’t just fire at the Heresiarch from one direction; move about and fire from different angles. This way, you’ve a much better chance of hitting him because shooting at him from the same angle simply causes him to freeze into invulnerable mode and your ammo will be wasted. Don’t be too distracted by the Dark Bishops when the Heresiarch starts summoning them. Just kill enough of them to keep their spiralling fireballs from draining too much life; don’t spend all your ammo on them since the Heresiarch is going to summon more anyway. Instead, concentrate on attacking the Heresiarch. His summoning the Bishops show that he’s quite badly hurt already. Kill him first, then you can take care of the remaining Dark Bishops. Also, don’t touch those bouncing mana cubes when the Heresiarch dies! They are very explosive and may kill you if you’re greedy and think that they’ll increase your mana points. After the Heresiarch dies, the Seminary will start to quake and tremble. Just stay still in a safe place until things calm down again. Hint: watch out for ettins that teleport in after you kill the Heresiarch. You’re probably very low on life at this point, and they like to come just at this wrong time to you up from behind. Now, several places on the west side of the Seminary have opened. Go there now, and enter the inner sanctum of the Heresiarch. Be careful! The Heresiarch is dead, but his followers are still around seeking revenge, so don’t put away your weapons yet! Jump inside the room where the Chaos Serpent was (you’ve probably seen this place from the outside before). The wall on the corridor behind you will open, and the portal leading to the next episode is standing there, waiting for you. Before you enter, you may want to explore the secret level first. If you’re ready to enter the portal, make sure you have enough health and ammo left, otherwise you’re not going to survive the next episode (yes, it’s that horrible!). You must kill the Heresiarch before you can get to this secret chapel. After you kill him, go to the north part of the Seminary where the magical walls area is. The pillars south of this area are now opening and closing. Go behind the pillars and take the elevator down. The portal at the bottom takes you to the Deathwind Chapel. There are three sections in this chapel, the Lava area, the Centaur Room, and the Goodies area. When you first come into the chapel, only the Lava area is open. This place is behind the door on your left as you enter the chapel. There are several Dark Bishops in the room, so be prepared before you open the door! After you get rid of them, activate the switch at the far end of the room. Stairs will rise on your left. Climb up these stairs to the top, where there’s a ledge with lava below. You need to jump into the lava and run to the opening on the right (make sure you see where it is before you jump! It’s not fun walking around on lava looking for something you can’t find). There’s a narrow staircase here that leads into a dark room with Dark Bishops. Activate the switch in this room. This switch activates the elevator in the next place you go to. Now, go back down to the lava, and run across to the opening. Go inside the room with a pillar. Step on the elevator behind the pillar, which takes you to two rooms where Dark Bishops were shooting at you earlier. There’s a door in the room on the right which takes you back to the room where you activated the elevator switch. Go to the room on the left and down the dark passage to another room with Dark Bishops. Activate the switch in this room. This opens something in the pillar in the elevator room. Go back there and examine the pillar. Activate the skull switch. Now a wall has opened on another side of the lava, which leads back to the first room in the Lava area. Run across the lava into the room. Now stairs have lowered on the other side of the room. Go down the stairs to a room with a large pit. Follow the ledge on the left carefully. There’s a pillar in the middle of the pit with a platinum helmet on it. Go to the ledge nearest to the pillar and jump on the pillar. Stairs will rise and join this pillar to the entrance of this room. Go back to the entrance, and now follow the ledge in the other direction. This leads to a switch which opens a wall back to the first room and also opens the door to the Centaur Room. Go back to the room where you entered this chapel, and enter the Centaur Room. Be careful of the pillars inside… They will start to rotate and move about. You have to time yourself carefully and run past them to the far end of the room. Don’t get crushed by the pillars! (You can also run past them before they start to move about). Pull the switch at the far end of the room. Walls will open, with goodies inside and more Centaurs. You have to run past the rotating pillars again to get out of the room. Now, the third door in the portal room should be open. Don’t rush inside! You’ll be stampeded to death by hordes of monsters. The best strategy here is to run inside quickly and get out again, and stand at the doorway; then either put traps (like poison clouds from the flechettes if you’re playing the Cleric) or whack away like mad at anything that tries to come out of the door. After you bash the guts out of the monsters, go inside the room. There are two teleports here, one on each of the dark sides of the room. Each teleport takes you to a small area which overlooks a courtyard with a statue in the middle. Pull the switches in both of these areas. This will open the door at the far end of the room, which leads to the courtyard with the statue. There are lots of goodies here, with a Krater of Might in an opening at the far end of the room. That’s all there is to this level. Collect all the goodies and ammo here and step into the portal that leads back to the Heresiarch’s Seminary. Now you’re probably more equipped for the next episode! Step into the portal that leads to the next episode, the Castle of Grief. I’m skipping the horrific superlatives again… (I looked at the monster count: over 100 in this single level!) It’s so crazy that even while Korax is giving you a polite little speech, a Chaos Serpent is breathing fireballs at you behind the wall — you’ll be fried unless you strafe to the side! Just as in the Heresiarch’s Seminary (episode 3), there are two phases in this episode. Your ultimate goal is to find the other Heresiarch and kill him (yes, you’ve to face another one of ’em!!). As the story says, “somewhere within, your enemies are waiting.” Somewhere in this castle episode, the Heresiarch is waiting. So, you’ve managed to find the way into the Heresiarch’s hideout. But you’re not done yet! The Heresiarch is not so easy to deal with. He’s waiting somewhere behind the Axe door. But where’s the Axe key? How do you get to the key? Of course, before you start looking for the gears, you must get into the castle first! You need to raise the bridge that leads to the front entrance of the castle. The switches to raise the bridge are in two small niches in the water on either side of the bridge. Pull both of them, and steps will be raised. Now you can get into the castle. As mentioned before, you need four gears. You can get them in any order you want, but I suggest that you follow my order, because I’ve arranged them so that you go from one part of the castle to another progressively. If you want, you can see the room with the Clock and fiddle with the panels now. Or, if you’re not in a hurry, read on. I’ll get you there eventually. This gear is the easiest to find. From the front entrance of the castle, go inside and go right (WEST). Enter the dark room on the west (I call this the West Room). The Silver Gear is sitting in the middle of the room. Warning: NEVER stand there and admire the beautiful, intricately made gear once you pick it up. This gear is in the room on the southeast corner of the castle. You need to activate five switches in order to get it. Each of the five switches are in one of the five towers of the castle. Go to the Gibbet Room in the centre of the castle (the round one where the Silver-rimmed Yellow Gear is). Jump on the window sill on the east side of the room. There’s a switch behind the pillar here: pull it and the four elevators in the front and back of the castle will be activated. The battlements of the castle are split into two parts, the one along the eastern wall, and the one along the western wall. The eastern battlements connects three towers, and the western battlements connect the other two. Just take the elevators up to the battlements, and look for a switch that looks like a skull in each of the five towers. You should activate five switches. After all of them are activated, go to the southeast room in the castle. Stairs should have lowered at one corner of the room. The Yellow-rimmed Silver Gear is on the shelf at the bottom of the stairs. Once you get the gear, fireball traps on the floor will activate. Run through them quickly to get back into the courtyard of the castle. The Yellow Gear is also in the Gibbet Room, but it’s on a platform that you cannot reach. To lower this platform, you need to press four switches on the outside of the castle. Follow the side of the wall carefully; some of the switches are quite well hidden. After you activate all four switches, the platform in the Gibbet Room will lower, with the Yellow Gear on it. While you’re looking for the four switches outside the castle walls, you’ve probably noticed the small opening on the southeast corner of the level with a portal inside. This portal leads to the Forsaken Outpost. There are some items there which you need to solve the puzzle of the Gibbet; so you should go and get them now. Also, there’s plenty of ammo there, for those of you who are running short of firepower. After all four gears are fitted in, the clock starts to move. Who cares, though? What you really want is the message that says that something has lowered in the Gibbet Room. Go there now, and get on the elevator that was activated. When the elevator gets to the top, activate the eight-pointed switch. This teleports you to the Gibbet. This is where you start. There’s a portal here that takes you back to the Castle of Grief, and a spire of stone on the pool in the middle. As the name indicates, the Axe Key Room is where the Axe Key is. This room is on the north of the Gibbet. You need the Axe Key to open the door to the Heresiarch’s Lair. But don’t be deceived! This doesn’t at all mean that getting the Axe Key is easy. You can see where the Axe Key is, but to open the cage where it is, you have to solve a string of other puzzles. This is the west room in the Gibbet. You need the Axe Key to get in. It’s some kind of throne room, because it has a jasper throne in the middle and many lamps and pillars around. As you guessed, the Heresiarch is somewhere inside here. Of course, you need to get the Axe Key first, before you can enter this room to face the Heresiarch. This area is on the south side of the Gibbet. There’s a library here, with bookshelves and study tables; and another area which has a door that requires the Dungeon Key. To solve the puzzles to open the cage where the Axe Key is, you must first get some required items from the Forsaken Outpost. If you have done so already, you can skip to the next step. If not, go back to the Castle of Grief. Go to the southeast corner, outside the castle. There’s an opening here with a portal that takes you to the Forsaken Outpost. You start in a dark cavern, with many monsters around. Go to where these caves opens into an open area with a deep chasm (there aren’t too many caves here, so you should be able to find your way around pretty easily). Follow the ledge on the right that goes to the doors where the Chaos Serpents are. Note: there’s a pillar in the chasm with many Repulsion Discs. You can jump to it, but only if you’re very expert. I suggest that you solve puzzles here first, and then come back, because a magic bridge will appear after you solve the puzzle. Enter the doors, which lead into a courtyard with a statue in the middle. There are two small rooms on the left and on the right. There’s nothing in them yet, so go to the far end of the courtyard where there’s a dark corridor. The big doors in front require the Rusted Key, which you’ll get later. If you go right on the corridor, it will lead to the ledge where the Chaos Serpent is. There’s a platinum helmet here. If you go left on the corridor, it will fork into two. The left turn goes to the other ledge with the Chaos Serpent, where there’s a quartz flask. Follow the right turn, which leads into a small dark room with a switch. Pull this switch. This opens a new room at the corner of the passage where you came in. Go inside the room and kill the ettins there. There’s a book lying on a pedestal in the middle. Wait! Don’t forget to pull out your weapons before you grab the Liber Oscura. This mystic book has many jealous guardians! It’s one of the items you need in the Gibbet. There’s a passage at the far end of the room which leads to one of the small rooms in the courtyard through a newly-opened exit. If you noticed, a wall has opened in the courtyard. The switch there lowers two platforms at the sides which lead to a small room with some items. Now, go to the other small room. A new passage has also opened here, as well as a wall with the Rusted Key inside. You can grab the Rusted Key now. The new passage leads into a dark room with a shallow chasm in the middle, and some Dark Bishops. Jump from pillar to pillar to get to the ledge at the other side of the room where there’s a switch and a Porkalator. Unlike many other places in this game, don’t worry if you fall into the chasm. It’s quite shallow, and there are some high steps that let you climb back up (the steps are high, so you need to jump in some parts). Pull the switch on the ledge. If you’re observant enough, you’ll notice a grey ball lying on another ledge in this room. This is a sleeping Afrit… unfortunately you can’t kill it yet. It’s invulnerable in this “ball” mode. After pulling the switch, another area has opened in this dark room. There’s some ammo there and a secret window which looks into the room behind the door that needs the Rusted Key (it’s a secret window because you can’t see it from the other side). There’s also a door here that will open much later. Go back to the courtyard now, and open the big doors with the Rusted Key. Watch out, though. There are many unpleasant monsters behind the doors. The doors lead to a big room with many crystal vials and quartz flasks. There’s also lots of ammo at the far corners. At the far end of the room, there’s rusty pillar. You need to open it by pulling four switches. The four switches are in four small rooms at the sides of this room. You must kill the monsters inside here before the rooms open. Once they open, go inside and pull the four switches. The rusty pillar will split into two, move to the side, and the wall behind it will slowly lower. There’s a book lying on the floor beyond. This is the Daemon Codex, which you need in the Gibbet. If you’ve pulled the switch in the Sacred Grove back in Episode 2, when you grab the Daemon Codex, a portal will open behind it. This portal leads to the secret level in this episode, Desolate Garden. It won’t open unless you pulled the switch in Episode 2; so if you didn’t pull the switch back then, forget about going to the Desolate Garden. Now that you have both the Liber Oscura and the Daemon Codex, go back to the portal that leads to the Castle of Grief. Along the way, you might want to grab the Discs of Repulsion on the pillar in the deep chasm. Note that you must jump onto the blue magic bridge, and jump back; it’s not really a bridge but just some kind of ‘stepping stone’ that helps you get to the pillar. Be prepared for some jealous monsters while you’re grabbing the Discs, though. Go to the Library Area in the Gibbet. There are two bookshelves on the wall here; these are actually rotating doors in disguise. The door on the left leads to the library; this is where you should go now. Several of the bookshelves have lowered into the floor. One of them has a skull with horns on it. Pick up this skull. This is Yorick’s Skull. Just like the two books, this skull also belongs somewhere… can you think of where? Go to the Statue Room now. If you haven’t been here yet, go and smash all the stained glass walls around here! Behind one of the stained glass walls there’s a switch. Pull this switch. Now the broken bridge that leads to the statue is repaired. Walk up to the statue. Notice anything unusual? This is some kind of stinking sewer, with lots of slime, grime and muck (hence the name Effluvium, which means a bad, repulsive smell). Just the kind of place for those slimy Stalkers! This is probably their favorite hangout: there are lots of them swishing around in the muck here. You start in some kind of drain, which flows ahead into a pool of muck in the room at the far end. Before you go there, you need to look for a switch in one of the small ledges on the side of the drain. If you’re observant, you’ll notice doors and walls in the other ledges that look like they might lead somewhere interesting. They do; however, you can’t open these places yet, at this point, so just find the switch and activate it. The switch opens a portal back to the Gibbet in one of the other ledges, and also lowers another drain on the other side of the room with the muck pool (which lets in some nasty shooting Stalkers as well). Jump into the muck pool, and go to the end of this other drain. There’s a ledge on the right, which leads into another room filled with muck. There are windows in this room that look out to the outside world. The door at the end of the room lets you out to breath some fresh air. 🙂 If you look carefully enough, one of the windows has something on its sill on the outside. This is the Dungeon Key. Go out the door and turn left. Walk over to where the windows are and grab the Dungeon Key. This is about all you can do in the Effluvium at this point. Go back and step into the portal that the switch opened earlier, to get back to the Gibbet. Now go to the Library Area in the Gibbet again, and go through the rotating bookshelf on the right. You’re now in a room with a cage in front, something that looks like a bed on one side, a bookshelf in one corner, and a wooden ledge with a switch at the end. There’s also a door that needs the Dungeon Key. Kill the Slaughtaur in the cage, and a wall beside the cage opens. This leads inside the cage itself, as well as into a room with many barrels. There’s a secret passage in this barrel room that isn’t open yet, so go back to the room outside the cage. The bookshelf in the corner lowers a platform underneath you if you activate it. This leads to a short passage with some monsters and a window beyond your reach that looks into a room with Dark Bishops. That room is behind the door that needs the Dungeon Key. To get out of this passage, pull the switch near the platform, which lowers it and takes you back to the first room. You need to pull the switch at the end of the wooden ledge. Watch out! As soon as you pull the switch, the wooden ledge collapses into a really deep pit! NO! you don’t try to run back after you pull the switch. The ledge collapses too fast for that. Rather, you must stand on the tiny piece of wood that’s left in front of the switch! Then, slowly turn around, and jump as hard as you can to get back on solid floor! (Hint: holding down the Jump key longer will help here… also, try to run forward at the same time.) This switch opens the room with the Dark Bishops that you saw earlier. Now, open the door with the Dungeon Key. Go inside the place that looks like a torture chamber, and turn right. The wall here should have opened (when you pulled that switch), and the room with the Dark Bishops is beyond. Go inside that room and pull the switch there. This lowers stairs in the room with barrels. Go to the room with the barrels now, which is behind the secret passage beside the cage in the first room. Go down the stairs at the far end of the room. Be careful here! At the bottom of the stairs, turn RIGHT. There’s a very deep hole on the left, so don’t ever back up into it! There’s a portal in the room here, which leads to the Dungeons. Step into the portal now. You start in a small room with the portal that leads back to the Gibbet. The exit of the room opens to a very large, dark room with a lava pool in the middle. Go there, and climb down the stairs. On the south side of this room, there’s a passage blocked with bars. Opposite the bars, there’s a wooden pillar with a switch that’s blocked by another piece of wood. You need to open both the bars and this switch. Go to the west side of the room now, where there are stairs leading into a really dark torture chamber. Go inside the chamber (watch out for monsters!) and go the west end. There’s a switch here you must activate. This switch opens the other switch on the pillar in the large room with the lava, and also opens the bars blocking the south passage. Go back to the large room and enter the south passage that is now accessible. This leads into a round area with seven cages. In the centre of the cages there’s a wooden pillar. A switch is hidden in this pillar, but it won’t open just yet. Go back out to the lava room, and press the switch on the wooden pillar. Each time you press this switch, one of the seven cages open. You can either open them all by pressing the switch seven times all at once, or, (recommended) press it once at a time, go to the opened cage and kill the slaughtaur first, before you come back to press the switch the next time. After all seven cages are opened, another switch appears in the pillar in the centre of the seven cages. Go and press this switch. This opens two new passages on the west side of the lava room. These new passages lead to the walkway above the really dark torture chamber. You can jump on the pillars with the goodies from here which you couldn’t reach before. There’s also a couple of secret doors on the pillars that lead to the goodies on the high ledge that you can see from the lava room. Go up the stairs on the southern passage, and take the first left turn. This leads to two rooms with ettins. There’s a porkalator in the farthest room. Come back out and continue along the passage. The second left turn leads to two cages with some nasties inside. The switch on the wall is worth mentioning here: if you pull it once, it opens the door to one of the cages. The second time you pull it, it opens the other cage. The third time you pull it, (notice the red eyes this time) it closes both cages. Continue along the passage, which turns a corner at this point. Take the left turn, and you’ll get to a room with small cages and mutilated bodies in them. There’s ammo at the far end of the room. Go back to the passage and continue. The next left turn leads to four rooms. The farthest room, on the northwest, (the one with many chains) has a secret door on the west wall, which leads to a long corridor that takes you to the room with the slaughtaurs at the end of the passage outside. There’s plated armor here. Activate the switch, and the windows will open so that you can get out without having to retrace your steps. Go east now, along the northern ledge. A new passage has opened on the left, which has a different wall texture. Go down the passage to a room with a gang of Chaos Serpents and several cages at the sides. There’s Another passage on the right that leads to another room with Chaos Serpents and cages at the sides. Stairs from one of those cages lead to the room on the east of the lava room. If you go down the stairs at the far end of that room, you’ll get back to the lava room. For now, come back to the first room with the Chaos Serpents and the cages at the sides. Examine the cages carefully. There’s a well-hidden switch in one of them. Pull this switch. Now a new passage has opened somewhere along the passage that you came in. This is very hidden, and won’t even show on your map unless you’ve looked in its direction. Go back along the passage where you came in and look carefully on the left. Walk down the steps in the new passage, to a curved room with a slimy river. Miracle! You’re still alive after all that drop! You’re now in a new part of the Effluvium. Many new places have opened on this level at this point, and it’s time to explore them! Go out the room and jump into the muck. Follow the current downstream. Along the way, you’ll come through a room with ettins. The door on the right takes you to the drain where you first entered the Effluvium earlier on, from the Gibbet. If you can’t wait to solve the puzzle, go there now and skip the following digressions. So, you want to muck around. 🙂 So, continue downstream in the room with the ettins (and of course, watch out for those Stalkers that are enjoying themselves in the muck and dirt). At the end of the journey, you’ll come to a very high room filled with muck. On the opposite wall, the muck is draining out from the room through a drainhole. There’s a winch on the left. Turn this winch now, and the hole closes. The muck will start to fill up the room… until the water level (or muck level, to be precise!) reaches two overflow-drainholes at the top of the room. You can now reach the ledge on the right side of the room where there’s a Mystic Urn and another winch. Grab the Urn, and turn the winch. Quickly jump back into the muck; the winch has re-opened the drainhole at the bottom of the room, and the water level (muck level) is dropping back to its normal level. If you don’t jump back now, the water level will be so low that you’ll get hurt jumping back in. OK, that’s enough disruption of sewer operation. 🙂 Go back to the room with ettins and go to the place where the portal to the Gibbet is. A wall has opened on the ledge opposite the portal. There’s a labyrinth of muck rivers beyond. Go inside there now. If you look carefully, you’ll notice a Porkalator on the other side of a drain hole. You’ll get there shortly… Now, go down the drain the leads from this room. It branches into three. Don’t worry; it’s not as confusing as it may seem. On the left, those walls are the walls of a room with a torch in it. I call this the Torch Room, because there’s a torch inside to help you see more clearly in these dark drains. The entrance is on the other side. If you look up in that room, you’ll see that you’re looking up through a sewer grating. The walls on the right are walls of another room, which I call the Dragonskin room. It’s not opened yet, so now, follow the drain on the right, and keep to the right wall. You’ll see the walls of a third room on your left. Look along the wall on your right carefully. Open the wall where there’s a rusty handle. There are two such walls; one leads into a room with a switch and a window looking out of the sewer, and the other leads to a platform that actually takes you outside. Activate the switch, and the walls of the third room lowers. There might be some monsters in that room. Now, the Dragonskin Room is open. There’s an elevator there that takes you up on a ledge with Dragonskin Bracers. Go to the platform that takes you outside to a small dark area with some trees. Look for another sewer hole in this area, and jump down into it. Go right. There, you got the Porkalator you saw earlier on. To get back, climb on the rusty platform which takes you back out to the area with trees. Jump back into the hole where the three rooms are. Now go back to where the Portal to the Gibbet is. Go down the drain beside the portal to the Gibbet. Jump into the pool of muck at the end of the drain, just like before, and walk up the other drain on the opposite side. Now, the ledge on the left has opened. Climb on it, and go into the big, dark room. Be careful here: there are Brown Serpents around. There are four mini reservoirs of muck here. Jump on the one closest to the top of the stairs where you came into the room (the southeast one). Now you can reach the other two mini-reservoirs on the north side by jumping from here. There’s a winch between the two reservoirs on the north side. Turn it now, and the muck will drain way from the two reservoirs. Jump into the northeast one. There’s a falcon shield in a small room to the north. The pillar on the south side of the reservoir is an elevator; activate it to get back out. Now jump into the northwest reservoir. There’s a portal in the room beyond that takes you to back to the Castle of Grief. You’ll come out in a hidden room at one end of the Castle’s moat. You can raise the wall to get out onto the moat and into the Castle. For now, step back into the portal to get back to the Effluvium. The portal will take you to the west side of the room with the four mini-reservoirs. Jump onto the southwest reservoir now. There’s also a winch between this reservoir and the southeast reservoir. Turn the winch to drain out both reservoirs. The southeast reservoir leads to a small chamber with some item. Again, the pillar in the reservoir is an elevator to take you back out. Go to the southwest reservoir. There’s a wall with a handle in the room beyond. Open this wall, and you’ll see another room behind the muck drain, with a Brown Serpent. Watch your step here! There’s a pit right in front of you! You must jump over it to get to the room with the Brown Serpent. This room has a waterfall (muck falls, to be precise). There’s also a rusty pillar which is an elevator. Activate it to lower it, and it’ll take you up to a door which opens into one of the ledges beside the drain with the portal to the Gibbet. Don’t go back to the Gibbet now; you haven’t solved the puzzle yet. Go back to the room with the muck falls. Climb on the ledge where the Brown Serpent was. Notice the wall here that has a handle on it. Pull it open to reveal a portal. Step inside. The portal takes you to a new room on the Forsaken Outpost. Unless you feel like bashing up more monsters, don’t break the stained glass walls. There are baddies behind them but only one or two goodies. 🙂 The rusty wall at the end of the room opens out to the room with the secret window. As you approach the rusty wall, you’ll get a message that something has opened on the Gibbet. Step back into the portal that leads back to the Effluvium, and take the portal in the Effluvium that goes to the Gibbet. Now you’re ready to solve the final puzzle in this episode! Go to the Axe Key room in the north side of the Gibbet. On the left, there’s a circular wall with flechettes on green pillars. If you want to grab the flechettes, be careful that you don’t get crushed… If you walk to the south side of the circular wall, a small room will open in the circular wall, with some Afrits and some items inside. On the right side of the room there’s a cage with some monsters inside and a pillar. If you’ve solved all the puzzles so far, the southeast corner of this cage will be open. Go inside and the pillar lowers, revealing the long-sought Axe Key. Grab the Axe Key, and go to the door of the Heresiarch’s Lair. Now you’re ready to face the Heresiarch! Open the Heresiarch’s Lair with the Axe Key. Note that the door will close after a short time, and it cannot be opened from the inside. You must make sure you have enough health potions and ammo to face the Heresiarch plus lots of monsters before you enter this door. Once you go in, there’s no return (unless you have the Chaos Device, of course). Note (by RambOrc, July 7, 2001): There have been many rumors about a malfunctioning script in this room, and the most exotic “solutions” have been posted throughout the web (like you have to jump on the throne when getting the icon or that the Bishops appear only when directly coming from the Effluvium and entering the Axe door), even the “hint” in the Official Hexen Strategy Guide is misleading (walking every inch of the throne then running to the south-east corner). In reality, the script is working the following way: after you kill the Afrits, Chaos Serpents teleport upon the steps leading to the throne. Every 6 seconds, a script checks whether there are Chaos Serpents in the room. If yes, the side doors open and the Dark Bishops appear. If the script finds no Chaos Serpents in the room, nothing happens. That means the script malfunctions only if you kill the Chaos Serpents before the next 6-seconds check comes. While not a very smart script, the moment you know how it works, you’ll never again have to be frustrated. Enter the Heresiarch’s Lair and kill the monsters there. Now, go up to the throne and jump on top of it when you grab the Icon of the Defender. This opens pillars at the sides of the room with lots of Afrits. Kill all the Afrits. Chaos Serpents will appear on the steps before the throne. Wait a couple of seconds until the side doors open and the Bishops appear, than kill the Chaos Serpents. Once you killed all the Bishops, a wall behind the throne opens, with a big star of lava on the floor and lots of quartz flasks lying around. The Heresiarch is standing on top of the star, prepared to beat the life out of you! You might want to review the tips on fighting the Heresiarch which I gave in Episode 3. After you kill the Heresiarch, the portal behind the lava star opens. This portal leads to episode 5, Necropolis. Note: in order to reach this level you must pull the switch in the Sacred Grove (Episode 2). If you don’t pull that switch, the portal to this level won’t open. The portal to this level is in the Forsaken Outpost. After all eight switches are pulled, the elevators on the north and south sides of the garden are activated, and the stairs there are opened as well, leading to new places to explore. The stairs on the north and south sides of the garden lead to the room where the Dark Bishops were. (This room is opened only if you pulled the ninth switch.) The portal here takes you back to the Forsaken Outpost. There’s also another room across the drain on the other side of the corridor. If you look carefully, there are drainholes on the floor in this room, and there’s a pillar on the far side of the room. Uh-oh! muck is overflowing from the pillar into the room! The water level (or muck level) is getting higher and higher… the ceiling is getting closer and closer… Hurry up and run behind the pillar at the far end of the room. Activate the switch there. This switch stops the overflowing muck coming from the pillar, and the muck in the room will drain away through the drainholes on the floor. That’s not all, though. A jealous Chaos Serpent will appear in a newly opened area opposite the door of the room. One of the parts of your fourth weapon is inside. The elevators on the north and south sides of the garden take you up to where the west side of the garden where some monsters were shooting at you earlier on. Be careful here, because there are more of them than you saw through the window. At first, the room here is split into two sections, one on the north side and one on the south. You can find your second and third weapons here, one on each section, as well as some ammo. If you go to both the two sections, a hidden area will open, joining the two sections, as you leave. There’s a Krater of Might inside. That’s about all you can do in this level. Grab all the goodies and items lying around, and step into the portal to the Forsaken Outpost to continue your quest. If you already killed the Heresiarch, time to move on to the Necropolis. So, you’ve come this far. You’ve destroyed the Death Wyvern, and you’ve killed the two Heresiarchs. Korax has enough meddling from you. 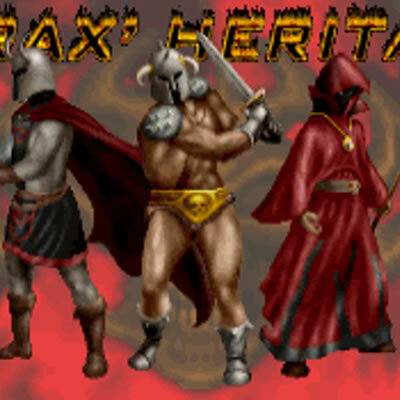 Your former masters (see the story of Hexen here), Zedek, Marshal of the Legion; Traductus, Grand Patriarch of the Church; and Menelkir, Arch-Mage of the Arcanum, are waiting for you in their tombs. (Korax gave them the gift of Unlife. My guess is that since “undead” means the living dead, Unlife means the “dead living”… which is probably why these three masters are in their tombs.) Each of them represents one of the three character classes in the game. Zedek represents the Fighter; Traductus, the Cleric; and Menelkir, the Mage. You must enter their tombs and defeat each of them. Then only you can reach your goal: to enter Korax’s stronghold, and destroy Korax himself. However, finding your three former masters in their tombs isn’t as easy as you think. Each of the tombs has its own puzzles, traps, and monsters which you have to deal with before you actually fight the master. When you first enter the Necropolis, you’ll meet the Reivers in swarms. Note that after you kill a certain number of them, more will rise from the ground. But don’t worry; they don’t keep coming forever. Once they rise from the ground once or twice there will be no more of them. You should walk around the whole graveyard and kill all of them so that they won’t interfere when you’re trying to solve the puzzles. Before you start solving the puzzles in the three tombs, however, you might want to visit the Vivarium. Note that it’s accessible only before you enter any of the tombs. After you enter any one of the tombs, the portal to the Vivarium will be sealed off forever. There’s a fair amount of goodies in there (and lots of monsters), so you might want to go there to ‘stock up’ on useful items before you fight the three masters and Korax himself. Once you’ve finished the three tombs, there’s only the Big Bad Guy left. You should have obtained the three special items from the tombs: the Glaive Seal, Sigil of the Magus, and the Holy Relic. (If not, go back to the tombs and get them!) You need these three items to continue. Now go to the northwest of the Necropolis, where there’s a door with a panel at the side. There are three outlines on this panel, each matching one of the Glaive Seal, the Sigil of the Magus, and the Holy Relic. Fit these on the panel, and the door opens. There’s a portal behind the door. Collect the mana here (there should be plenty — and you need them! ), gather all your resources together, and prepare for the final battle. Enter the portal to the Dark Crucible, the stronghold of Korax: your final objective. Reminder: This level is accessible only before you enter any of the three masters’ tombs. After you enter any one of their tombs, the portal to the Vivarium will be closed forever. There are four crushers in the centre of the Vivarium. There’s combined mana in the crushers; when they open, quickly jump on them, grab the mana and get out before you get crushed. There’s a large area with many, many goodies on the south side of the Vivarium. This is behind you when you first enter the Vivarium. To open this place, you need to blast the wall with a powerful weapon. For the fighter, you need to blast it twice with the Hammer of Retribution, or once with the Quietus. Simply punching it won’t do much. Once it opens, there’s plenty of health and ammo inside. Another possibility to reach this area is to let yourself be transformed into a pig (from the traps in the windowed rooms at the two ends of the long hallway), and run through the low passage in the middle of the hallway (near to your start position). On the east and west sides of the Vivarium there are areas with traps. If you look carefully, there’s a stained glass wall in the north side of each of these areas. Jump through the window to get into each of the traps area (watch out for the traps! ), and push (ie., run against it, not activate) the stained glass wall. It’s a rotating door. The stairs behind it lead to the each of the two ledges overlooking the centre of the Vivarium. There’s usually an item or two on these ledges. The north side of the Vivarium has a dark area with some monsters shooting at you. Shoot at the walls under the dark area (or punch it if you’re close enough) and it will lower. Step on it. When it rises again, walk to the pillar in the middle, where there’s a maulotaur statue. Walking in front of it lights it up and opens a door behind you. Watch out; there’s usually a few baddies inside who will blast you from the back. There’s a portal behind this door that leads back to the Necropolis. Before you enter the portal, walk behind it. There’s a porkalator there. After you collect the goodies in the Vivarium, step into the portal back to the Necropolis, and continue your quest. There’s a door on the southwest of the Necropolis. This door leads to a long corridor with lots of centaurs. The portal to the Tomb of Zedek is at the end of the corridor. Note: after you open this door, the portal to the Vivarium will be closed and locked. When you first enter the Tomb of Zedek, it’s a long corridor with some rusty pillars some way towards the end. If you look at the map, the shape looks like a giant Quietus! Walk to the end of the corridor where there’s a door. Watch out when you approach the rusty pillars on the way! When you come near, the pillars will begin to move to the side. When all the pillars have moved to the side !CRASH! the ceiling slams down, and slowly rises after a while. The pillars will move back to their original position. Now it’s safe to cross over. There’s a dark room behind the door, with many pillars. Activate the switch on the east wall, and go back to the corridor. Now, a semi-circular corridor has opened on the east side of the Tomb. Go to the middle of the semi-circle and activate another switch there. This opens small rooms along the circular corridor with monsters inside them, and also opens another semi-circular corridor on the west side of the Tomb. Go to the middle of the semi-circle on the west, and activate the switch there. Just like the other switch, this opens small rooms along this corridor with monsters inside. Now, go to the room on the west, where there’s a switch a three grey squares on the wall. When you activate the switch here, the three grey squares start to rotate. When they stop rotating, memorize the symbols on them. Make sure you remember the symbols, and also the order of the symbols on the three grey squares! Now, go back to the large room with pillars. This time, the door will shut behind you. The ceiling will start to move down slowly! You’ve only a limited time now. Go to the west side of this room, where there’s also three grey squares. Turn these squares so that the symbols on them matches the symbols you’ve just seen on the other three grey squares in the other room. Note that you must get the order right too. Once you got the correct order of symbols, the ceiling will rise again. Now, the door on the north side of the room will open. Pull out your best weapon, and enter the door. The tomb slowly opens, and Zedek steps forward… to give you a sound beating! After you kill him, a pillar will lower, with a Glaive Seal on it that looks like a mini-version of the Quietus. Pick this up; you’ll need it later on. That’s it. You’ve finished this tomb. Go back to the portal and return to the Necropolis. Note: for those of you who have trouble killing Zedek, here’s a dirty trick I use to get the first shot at him: when you enter the room, quickly run to the opposite side, and wait there. When Zedek appears, his back will be facing you, so he won’t see you and attack immediately. Now, take a careful aim, and give him a good blast! However, this doesn’t guarantee that he’ll be killed. You still need to fight him, but at least you can hurt him first before he attacks you. The portal to the Tomb of Menelkir is on the east side of the Necropolis. Enter the door with the pillars at the sides. Note: opening this door will close the portal to the Vivarium for good. There’s a big door at the far end of the room. Go and open it. It will start to open, and then close again, and you get a message saying, “The portal has been sealed. Choose your fate.” Eight switches will appear in the room. One of these switches will open the door; the others will open small rooms at the sides with Dark Bishops in them. So far, I haven’t been able to tell which switch opens the door; I simply pull all of them and kill the Dark Bishops. Once the door is open, go inside, grab the Krater of Might and step into the portal. You start in a circular room with four symbols on the wall. Look at the pillar in the centre of the room. There’s a symbol on it. Find the symbol on the wall that matches this one, and activate it. This will open the next room. If you activate the wrong symbol, a gang of ettins will teleport in to bash you up. The third room is a triangular room. Again, there’s a symbol on the pillar in the middle. Find the matching symbol on the wall and activate it to open the fourth room. The fourth room is a circular room with a deep pit. There’s a magic blue bridge that lets you get to the pillar in the middle, which has four symbols on it. Again, look at the map! What does this room look like? Find the symbol with this shape and activate it. Now, go to the fifth room, which is another triangular room. By now, you should now what to do: activate the symbol on the wall that matches the symbol on the pillar in the middle. The sixth room is another circular room. I don’t think I need to repeat myself here. You should know which switch is the right one. Another triangular room… same story goes for this one. There’s a pillar in the room, which will open layer by layer. Menelkir is standing there, ready to for battle! Depending on which character class you’re playing and what difficulty setting you use, Menelkir may either be using his Bloodscourge or his Arc of Death. Kill him, and a pillar will lower with the Sigil of the Magus on it, that looks like a mini-Bloodscourge. You need this, so get it. A portal will also open now, which takes you back to the Necropolis. The portal to the Tomb of Traductus is on the northeast of the Necropolis. Open the door there that leads to a dark chamber. Note: opening this door will lock the portal to the Vivarium for good. There’s a rusty crate in this room that’s different from the rest. (For those of you who can’t find it, it’s at the northeast corner of the room.) Step on it, and it will lower. There’s a switch at the bottom: pull it. Now a wall has opened in the room. There’s an elevator behind the wall. Pull the switch there to lower the elevator. Be careful here, though. Quite a few Brown Serpents are waiting for you at the bottom. There’s an opening at the north side of the rocky area at the bottom. Go through the opening and turn left. There are stairs here that take you up on the ledge where a Brown Serpent was shooting at you earlier on. Go right on the ledge. There’s a switch in the corner. Pull this switch, and the portal to the Tomb of Traductus opens downstairs. Go back down the stairs and enter the Tomb of Traductus. You start in a dark cavern. Follow the passage and turn right when it forks. (If you turn left, this leads to the portal that returns you to the Necropolis.) Watch out for Brown Serpents when the passage opens out into a room. The entrance to the Tomb is in front. Go down the long passage. There’s a secret passage on the right at the first pair of stained glass walls, which leads to a dark room with some Dark Bishops and quartz flasks. At the second pair of stained glass walls, the stained glass on the left is actually a one-way wall. You can walk through it into another secret room with some health potions. Usually there’s a Dark Bishop or two hiding behind the one-way wall, shooting at you. If you walk to the end of the passage, the floor will lower. Usually I run there and quickly run back before the floor lowers, because there are many Dark Bishops down there! After killing the Dark Bishops, jump down to the bottom. This is a triangular area; there’s a door on the north side of the triangle. Enter the door there. There are three switches behind the door. The middle switch opens the area inside the triangle, where Traductus is. The other two switches open two other areas on the east and west sides of the triangle. It’s not a good idea to pull all three switches, because there are Dark Bishops in the other two areas, and they might interfere when you’re fighting Traductus. The area on the west is a spiral staircase with a Falcon Shield at the top. But there’s a trap there: when you get the Falcon Shield rooms full of Dark Bishops will open beside the stairs. The area on the east also has stairs, that lead to a few small rooms. Walking inside the first room will open a few other rooms. You can find the Icon of the Defender here, among other things. Once you pull the middle switch, the area inside the triangle opens, and Traductus appears. Watch out for his Wraithverge! You need Discs of Repulsion to keep those ghosties away. After you kill Traductus, a pillar lowers, with a Holy Relic on it, that looks like a mini-Wraithverge. Don’t forget to take it with you. That’s about it. The elevator on the south end of the triangle is activated now, so go back up and step into the portal that takes you back to the Necropolis. To get out of the Brown Serpents area in the Necropolis, pull the switch opposite the portal. This lowers the elevator where you came down on. Now you can continue your quest. The entrance to Korax’s stronghold looks really eerie! Crimson red sky, pitch black shadows, and corpses on spears. Even the bridge is swinging. But you’ve come this far, and there’s no turning back. Go across the bridge and enter the door. The strange echoing sound that you heard when you first entered the Dark Crucible is the sound of Korax. Open the door in front, and there’s a big hall in front. And on the opposite side is none other than the long-sought Korax! Don’t just stand there and stare at him. He hates that, and you’ll find out real soon that it’s not different flavours of ice-cream he’s throwing at you… 🙂 Be extremely careful of his fireballs! He shoots many fireballs with his many arms and the fireballs converge into a single blob of death that can kill you with one hit! He uses the fireballs of different monsters: the yellow ones the Chaos Serpents breath, the light green ones Brown Serpents breath, the blue ones Slaughtaurs shoot, the green ones Stalkers throw, the fiery ones Reivers throw, and the yellow ones Afrits shoot. (Hmm… did I miss any?) I don’t know if he also uses the frost shards Wendigos shoot… probably not. Another word of advice: don’t walk up to him to discuss your differences either: that brownish trail isn’t a carpet! 🙂 And he also hates uninvited people treading his hall. He can fire lightning upwards with his arm to control different traps in the hall, such as activating fireball spitting devices on the ceiling, or turning almost all the floor in the hall into lava! Beside these, there are also crushers scattered around the hall. After you hurt him enough, he teleports away like the coward that he is. And he opens two pairs of really packed rooms on the far east and west sides of the hall. These rooms are jam-packed with countless ettins and centaurs! They’ll come swarming on top of you, the ettins first, followed by the centaurs, after you’ve killed all the ettins. You probably need many Discs of Repulsion to keep them from stampeding you to death as you shoot at them. Once you finish off these troops, the doors on the north side of the hall opens to reveal another big hall beyond. Korax now teleports between several locations in both halls, and sends more of his troops from another two pairs of jam-packed rooms in the second hall. This time, they are Chaos Serpents (perhaps with Brown Serpents mixed in as well). Watch out as they literally rain fireballs on you! Also, be careful when you’re running back and forth attacking the monsters. Korax can turn most of the floors in the two halls into lava, and activate fireball traps. After you litter the two halls with the carcasses of the Serpents, Korax will begin to summon more monsters. Dark Bishops will appear, as well as invisible Chaos Serpents (that shoot the more damaging green fireballs like Brown Serpents!) and invisible centaurs. These invisible monsters don’t leave any carcasses when they die: they simply disappear. When you reach this point, don’t waste your ammo on these monsters! Kill just enough of them to keep them from getting in your way, and concentrate on Korax! You should have kept enough Kraters of Might to keep you going (there are also a few scattered around the two halls). Now, gather yourself together, and step into the portal. After all the excitement in the final battle, you can at last sit back and watch the conclusion.